Key Metric Software is proud to announce the release of SQL Backup Master v4.5. This new version includes a number of helpful improvements, including formal support for Windows Server 2019, custom script execution timeout support, the ability to export backup logs as HTML, and much more. For a full list of changes, please see the SQL Backup Master product release notes. 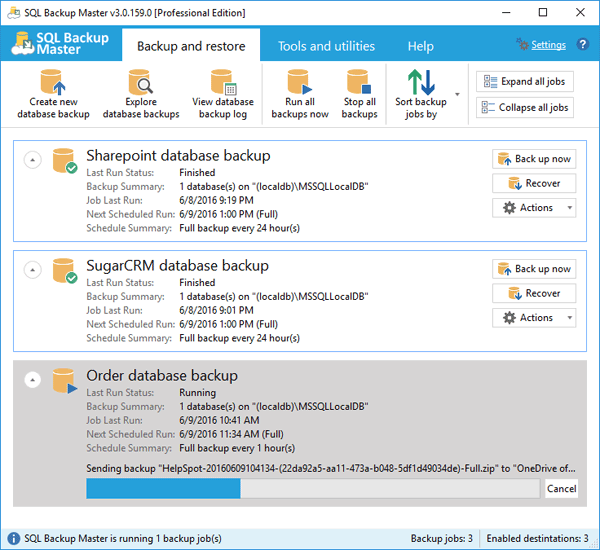 SQL Backup Master v4.3 introduced the ability to pass custom parameters to the database backup command that is sent to SQL Server. One example of how this capability can be useful is if you wish to enable SQL Server’s built-in backup compression capability. Before you begin, though, keep in mind that native backup compression is available only in certain versions and editions of SQL Server. You’ll need the Enterprise or Standard edition of SQL Server 2008 R2 or later to use this feature – it isn’t supported in lesser editions such as Express, Web, etc. It’s also worth noting that SQL Backup Master’s compression feature will typically yield superior results than SQL Server’s built-in backup compression. However, SQL Server’s backup compression feature has the advantage of requiring less working disk space and in some cases might be a better fit for your backup workflow. The result is shown in the screen shot below. Next, you’ll likely want to disable SQL Backup Master’s compression feature. Although you aren’t strictly prohibited from using it in conjunction with SQL Server’s built-in backup compression, you won’t typically see much (if any) benefit from doing so. To disable it, select the Compression & Encryption tab in the backup job settings window and select the Compression Disabled option. You can now save your changes and execute the backup job. The resulting database backup will have a .bak file extension and should be appreciably smaller than its uncompressed counterpart. IMPORTANT: We strongly recommend that you run backup and restore tests every time you change your backup job settings – especially when using advanced features like the one described above. Failed to create backup: Cannot perform a differential backup for database “XYZ”, because a current database backup does not exist. This error occurs because the SQL Server backup chain for the specified database is being invalidated. Let’s review possible causes. Some backup solutions (including NTBackup) will take a snapshot of your SQL Server database via the Windows Volume Shadow Copy Service. These snapshots will invalidate any previous differential backups, thereby interfering with tools such as SQL Backup Master. 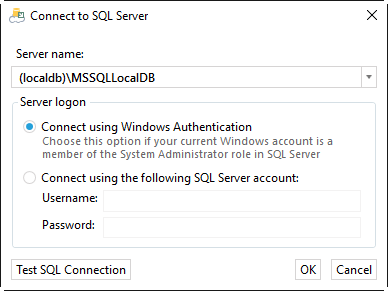 VSS creates database backups through a Windows system service called SQL Writer Service. When enabled, this service allows backup applications to copy SQL Server data files while SQL Server is running. Press Windows + R keys to open the Run dialog, then type services.msc and press Enter. Find the SQL Server VSS Writer service and double-click on it. Click the Stop button to stop the service, when change the startup type to Manual. When the service has been disabled, use SQL Backup Master to trigger a full database backup to re-establish the state of the backup chain. If the SQL Server database recovery model has recently changed, you should manually trigger a new full backup in order to reinstate the database backup chain. Once this is done, future differential backups should run successfully. Microsoft knowledge base article #921106 describes a bug in SQL Server 2005 that can cause this problem. The KB article also provides a hot fix. If you’ve reviewed the above causes and solutions are still experiencing this problem, please feel free to contact our support team. We’re always happy to help. Job Execution Error: Cannot open backup device ‘<Path>’ Operating System error 3 (The system cannot find the path specified. BACKUP DATABASE is terminating abnormally). The key to solving this problem is to first understand that SQL Server must be able to write database backup files directly to the temporary backup folder location specified in your backup job settings. When SQL Server cannot access this temporary folder location, the database backup file cannot be created and the process fails with “Operating System error 3”. Now let’s look at possible underlying causes. 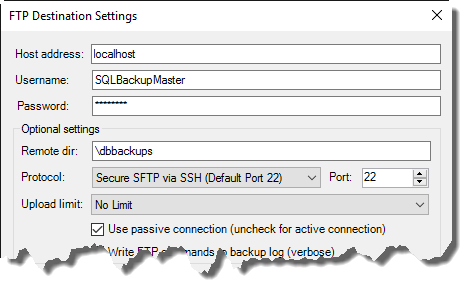 Regardless of how you configure a backup job within SQL Backup Master, SQL Server itself runs within the security context of the account specified in the SQL Server system service configuration. To find out which account is being used click Start, click in the Start Search box, type services.msc, and then press ENTER. 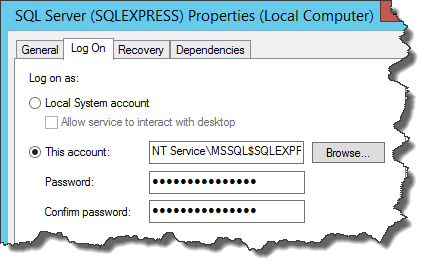 Find your SQL Server instance in the services list and double-click it, then select the Log On tab. It is this “log on” account that must have sufficient permissions to write to the temporary backup folder location. Check the permissions on the temporary backup folder by right-clicking it in Windows Explorer, selecting Properties, then navigating to the Security tab. Make sure that the account SQL Server is using has explicit read/write permissions for this folder. Also, here’s a quick tip. If you’re uncertain as to whether folder permissions are at the root of your problem, just temporarily give “everyone” full permissions to it. If your backup job tests and executes successfully after doing so, you’ll have confirmed that permissions problem are the root issue and can narrow them down from there. If you’re attempting to specify a backup folder location that resides on a remote (network ) file system, we strongly recommend that you do not use a mapped drive letter for this purpose. In Windows Vista and later, mapped drive letters are bound to the Windows security context that was used to create them, and SQL Server will usually not be able to access the mapping for this reason. The solution to this problem is simple: use a fully qualified UNC path instead of a mapped drive letter. So, for example, instead of using “Z:\DBBackups” (where Z is the mapped drive letter), specify a fully qualified UNC path such as “\\remote-server\DBBackups”. If your SQL Server instance and your database backup folder are on computers in separate Active Directory domains, then a missing or expired trust between the domains may cause this problem – even if the file system permissions are configured appropriately. You can resolve this issue by ensuring that a trust between the two domains is established. 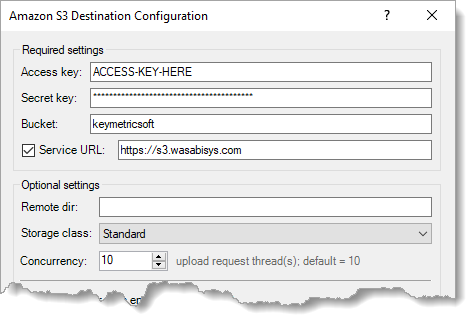 You may also need to configure the SQL Server service account with pass-through authentication between the domains. When using SQL Backup Master, “Operating System Error 3” is an indication that SQL Server is unable to write to the temporary backup folder location specified in your backup job settings. If you need further assistance with troubleshooting this problem, please don’t hesitate to open a support request with us. We’re happy to help. Key Metric Software is proud to announce the release of SQL Backup Master 3. IMPORTANT: If you’re licensed for a previous version of SQL Backup Master and are interested in upgrading to this new release, you’ll need to upgrade your license before installing the new release. If you install the new version without upgrading your license first, it will revert to the features and functionality of the free version.